To study the currently available data of recurrence rates of functioning and nonfunctioning pituitary adenomas following surgical cure and to analyze associated predisposing factors, which are not well established. A systematic literature search was conducted using Medline, Embase, Web of Science and the Cochran Library for studies reporting data on recurrence of pituitary adenoma after surgery, in nonfunctioning adenoma (NF), prolactinoma (PRL) acromegaly (ACRO) and Cushing’s disease (CUSH). Of 557 initially retrieved potential relevant studies 143 were selected. Recurrence in NFA was defined as reappearance of tumor on MRI or CT. Increase of hormone levels above normal limits as set by the authors after initial remission was used to indicate recurrence in the functioning tumor types. Remission percentage was lowest in NFA compared with other tumor types (P < 0.001). Surgery-related hypopituitarism was more frequent in CUSH than in the other tumors (P < 0.001). Recurrence, expressed as percentage of the cured population or as ratio of recurrence and total patient years of follow-up was highest in PRL (P < 0.001). The remission percentage did not improve over 3 decades of publications, but there was a modest decrease in recurrence rate (P = 0.04). Recurrences peaked between 1 and 5 years after surgery. Most of the studies with a sufficient number of recurrences did not apply multivariate statistics, and mentioned at best associated factors. Age, gender, tumor size and invasion were generally unrelated to recurrence. For functioning adenomas a low postoperative hormone concentration was a prognostically favorable factor. In NFA no specific factor predicted recurrence. Recurrence rate differs between pituitary adenomas, being highest in patients with prolactinoma, with the highest incidence of recurrence between 1 and 5 years after surgery in all adenomas. Patients with NFA have a lower chance of remission than patients with functioning adenomas. The postoperative basal hormone level is the most important predictor for recurrence in functioning adenomas, while in NFA no single convincing factor could be identified. Over the last four decades the preferred treatment of choice of pituitary adenomas has been transsphenoidal surgery, although primary medical treatment is currently used in most patients with prolactinoma and in selected patients with acromegaly [1, 2, 3, 4]. The obvious advantage of surgery is the quick relief of signs and symptoms, and the arrest of permanent damage to organ systems caused by the hormonal excess. Recurrence of a pituitary adenoma after apparent cure is well recognized, but the clinical predictive factors associated with relapse have not been studied systematically and compared between different types of adenomas. The purpose of this study is to present a systematic review and meta-analysis of publications spanning the last three decades of pituitary surgery and reporting remission and recurrence of pituitary adenomas during long-term follow-up studies. Particular attention was given to clinical factors predicting recurrence of an adenoma, also when this was not the primary goal of the reported study. Many factors may influence the proliferation of pituitary adenomas, such as angiogenesis, apoptosis, growth factors, oncogenes, tumor suppressor genes, and hormone receptors [5, 6]. However, we did not include reports investigating the association of biochemical tumor factors with the risk of recurrence of the adenoma, since the majority of these reports was not based on unselected patient groups. The following databases for studies addressing the recurrence of pituitary adenomas after transsphenoidal surgery were searched: PubMed, Cochrane Library, Web of Science, EMBASE, CINAHL, PsycINFO, Academic Search Premier and Science Direct. The final search was performed on August 1, 2011. We devised a search strategy for the mentioned databases with the help of a trained clinical librarian focusing on pituitary adenomas, treatment and recurrence after treatment. All relevant keyword variations were used, including free text words. The references of the relevant articles were checked for additional articles. Original articles in the English, German, French and Dutch languages were included. Studies were eligible for inclusion in this review when they fulfilled the following criteria: more than 20 patients included with a mean follow-up period of at least 1 year. Studies were excluded when restricted to elderly patients (>80 years) or adolescents and children, when patients underwent repeat pituitary surgery, pituitary irradiation, transcranial surgery, or in the presence of rare pituitary adenomas e.g. TSH secreting adenomas or functioning gonadotropinomas, hereditary tumors, e.g. MEN I syndrome or when regrowth and recurrence of nonfunctioning adenomas were considered as equivalent entities. In case of (partial) duplication of cohorts, the paper with the longest duration of follow-up was included in the review. Initial selection of studies by title and abstract was performed by one reviewer (FR) and these studies were retrieved for full assessment. Three reviewers independently evaluated all studies and disagreement was resolved by consensus. The retrieved documents were screened and evaluated with a question list of 60 different items, which was then used to construct the database. The list included bibliographical details, background of the study, study design, recruitment period, inclusion and exclusion criteria, details on diagnosis, type of hormone assays used, normal test values, and eventual preoperative medical treatment. Furthermore we noted the number of included patients, the total number undergoing surgery, the number lost to follow-up, deaths, duration of follow-up, surgical details, criteria of cure, details of CT and MRI investigations, immediate postoperative results, surgically induced hypopituitarism, improved hypopituitarism, used methods for diagnosis of hypopituitarism, number of recurrences in time, histology of the tumor including immunohistochemistry, presence of invasiveness, and potential tumor growth factors. Finally we looked for recurrence-associated factors, e.g. age, gender, tumor size, postoperative hormone concentrations, invasiveness (macroscopic and microscopic), surgical technique, surgical center, biological tumor factors and the used statistical analyses. Primary outcomes of this review were short-term remission after single surgery and induced pituitary failure. To this end we used the criteria set by the authors of each publication, either biochemical or in case of nonfunctioning adenoma (NFA) CT and/or MRI evaluation. The other main primary outcome was the incidence of recurrence of the adenoma after clinical cure, as reported by the authors. In case of NFA the postoperative CT or MRI should show no tumor remnant and studies using regrowth of a tumor remnant were excluded, unless a distinction between the two cases was made clearly. In addition we carefully evaluated clinical factors associated with recurrence were carefully evaluated. Statistical comparison between groups was done with ANOVA, with selected post-hoc contrasts. Regression analysis was used for time-dependent observations. P values < 0.05 were considered significant. The initial search resulted in a total of 1,663 publications. Of these 1,106 were excluded on the basis of title and abstract. The remaining 557 articles were assessed for inclusion in this study, and a further 427 articles were excluded on the basis of reading the full text, leaving 130 studies which fulfilled the criteria of our search. Thirteen papers were identified from other sources, mainly from references cited in the read papers. Details of the search strategy with the distribution along the 4 main groups of pituitary adenomas are shown in Fig. 1. Thirty studies reported results on surgery in prolactinoma patients [7, 8, 9, 10, 11, 12, 13, 14, 15, 16, 17, 18, 19, 20, 21, 22, 23, 24, 25, 26, 27, 28, 29, 30, 31, 32, 33, 34, 35, 36], 31 studies in NFA [9, 37, 38, 39, 40, 41, 42, 43, 44, 45, 46, 47, 48, 49, 50, 51, 52, 53, 54, 55, 56, 57, 58, 59, 60, 61, 62, 63, 64, 65], 32 studies in acromegaly [12, 18, 19, 29, 49, 66, 67, 68, 69, 70, 71, 72, 73, 74, 75, 76, 77, 78, 79, 80, 81, 82, 83, 84, 85, 86, 87, 88, 89, 90, 91] and 50 studies in Cushing’s disease [12, 19, 29, 92, 93, 94, 95, 96, 97, 98, 99, 100, 101, 102, 103, 104, 105, 106, 107, 108, 109, 110, 111, 112, 113, 114, 115, 116, 117, 118, 119, 120, 121, 122, 123, 124, 125, 126, 127, 128, 129, 130, 131, 132, 133, 134, 135, 136, 137, 138]. The distribution of these reports across the years is shown in Fig. 2. The number of patients treated with a single surgical procedure for prolactinoma, NFA, acromegaly and Cushing’s disease were respectively 3,152, 5,022, 3,548 and 5,787 patients. The absolute number of remission in these groups were 1,949, 2,232, 2,162 and 4,207 patients, respectively, with an overall remission percentage of respectively 61.7, 44.4, 60.9 and 72.7% (see Table 1). The remission percentage, as reported in the papers, is shown in Fig. 3. The mean remission values and (ranges) were 68.8% (27–100) in prolactinoma, 47.3% (3–92) in NFA, 61.2% (37–88) in acromegaly, and 71.3% (41–98) in Cushing’s disease. The surgical results are also shown as box plots in Fig. 3. Patients with NFA had a lower remission percentage compared with the other patient groups (P < 0.001). Patients with Cushing’s disease had a higher remission percentage than patients with acromegaly (P = 0.01). The overall surgical results with respect to postoperative normalization according to criteria set by the authors did not show an improvement over the last 3 decades (publication year coefficient −0.18 ± 0.17, P = 0.29, see Fig. 4). The incidence of new, surgery-related pituitary deficiencies is displayed in Fig. 5. It should be noted, however, that only 55% of the studies reported data on surgery-related pituitary deficiencies, as shown on the ordinate of the figure. 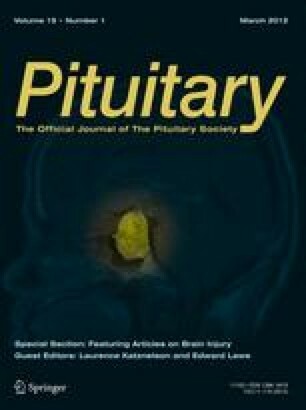 The incidence of pituitary insufficiency was highest in patients with Cushing’s disease (P < 0.0001), but the incidence of (new) pituitary insufficiency in NFA patients was not higher than in patients with prolactinoma or acromegaly (P = 0.22). The absolute number of patients in remission after surgery who were included in follow-up studies is shown in Table 1. This table also shows the total duration of follow-up in years and the number of recurrences. The mean reported years of follow-up was 4.90 ± 0.57 in prolactinoma, 5.13 ± 0.24 in NFA, 6.36 ± 0.58 in acromegaly and 4.91 ± 0.34 in Cushing’s disease. The follow-up was longer in acromegaly than in the other groups (P < 0.01). The percentage tumor recurrence as mentioned in the papers or calculated from available data is shown in Fig. 6. The recurrence incidence was lowest in patients with acromegaly (P < 0.0001). Prolactinoma patients had a higher recurrence incidence than patients with acromegaly and Cushing’s disease (P < 0.0001), but there was no difference between patients with NFA and prolactinoma (P = 0.17). Studies with a different follow-up period could be compared when recurrence was expressed as number of recurrences per total years at risk. The overall recurrence rate, related to follow-up years, could be calculated from the data shown in Table 1. This was respectively for the 4 groups 0.034, 0.022, 0.007 and 0.023 patients/years. The recurrence rate for the 4 groups, as defined above, is shown in Fig. 7. Patients with acromegaly had a better long-term outcome than patients in the other 3 groups (P < 0.0001), while patients with a prolactinoma had a higher recurrence rate than patients in the other groups (P < 0.001). There was no difference between NFA and prolactinoma patients (P = 0.09). No change in recurrence incidence was observed over 3 decades of publications (P = 0.51), although the recurrence rate showed a modest improvement with time (coefficient −0.0007 ± 0.0003, P = 0.04, see Fig. 8). The majority of recurrences occurred between 1 and 5 years after surgery, although patients with acromegaly and NFA also displayed a significant number of recurrences between 5 and 10 years (Fig. 9). These data were based on papers that provided details on recurrence during follow-up (77% of the prolactinoma papers, 71% of NFA papers, 72% of acromegaly papers and 70% of papers on Cushing’s disease). There was a weak linear correlation between recurrence percentage and remission percentage (R2 = 0.032, P = 0.03). Short-term and long-term surgical results did not differ between European and American studies. The search of prognostic factors involved in pituitary adenoma recurrence was hampered by several factors. Some studies reported zero recurrences during follow-up, thus logically excluding any prognostic factor. This was the case in 6 studies in NFA [37, 49, 52, 56, 60, 139], 1 study on prolactinoma , 12 studies in acromegaly [12, 29, 49, 68, 73, 76, 79, 89, 90, 140, 141, 142] and 3 studies in Cushing’s disease [118, 120, 136]. Studies with a low absolute number of recurrences mostly did not generally provide clinical details and finally multivariate analysis was rarely performed when a sufficient number of recurrences were present. We were therefore obliged to apply a simplified approach and we selected studies where one or more factors, such as age, gender, tumor size, invasion etc., were considered to be associated with recurrence or excluded as a significant factor for it, and scored these as ‘yes’ and ‘no’, respectively, as shown in Fig. 10, with the bars representing the number of studies. The figures at the end of the bars are the absolute number of patients with relapse, and the total years of follow-up in patients at risk. In NFA, age [40, 44, 51, 54, 55, 57, 61, 63, 143], gender [40, 44, 45, 51, 54, 57, 61, 63, 143], tumor size [40, 44, 51, 54, 55, 57, 61, 63, 143], and tumor invasion had prognostic significance in some studies[40, 41, 64], but not in others [51, 54, 57, 63]. Histology was a predictor in some studies [40, 43, 47, 57, 58], but not in others [54, 61, 64, 143]. In prolactinoma, age [15, 21, 24, 27, 144], gender [21, 23, 24, 27] and macroscopic and microscopic tumor invasion were not significant factors for recurrence [15, 21, 24, 26, 27]. Tumor size was not a convincing factor [7, 8, 10, 15, 30, 34, 144] while a low basal postoperative PRL concentration (below 10 or 6 μg/L thus much lower than the upper normal basal PRL level of 20 or 22 μg/L) [7, 15, 23, 24, 28, 30, 34, 144] and normalization of the TRH test were favorable clinical factors associated with permanent cure [10, 21, 30]. In acromegaly, tumor recurrence was unlikely in patients with a low postoperative GH concentration [69, 87, 145, 146], a low glucose-suppressed GH concentration [147, 148], or with normalization of the paradoxical GH increase after TRH infusion . Tumor size [66, 69, 71, 81, 145, 146] and invasion [66, 84] were not definite prognostic factors in acromegaly. In Cushing’s disease, age [98, 117, 134, 150], gender [117, 134, 150],tumor size [95, 98, 111, 117, 121, 132, 134, 150] and macroscopic tumor invasion [95, 98, 117, 134] were not prognostic factors of recurrence. Microscopic tumor invasion [29, 92, 117, 126, 134], as well as postoperative dexamethasone tests [93, 95, 96, 98, 114, 134] were undetermined factors. However, a significant positive and favorable factor was a low basal postoperative cortisol concentration in more studies [19, 29, 93, 97, 99, 104, 105, 107, 109, 112, 113, 114, 116, 121, 122, 123, 127, 129, 130, 133, 151], than in those which did not confirm this finding [92, 95, 98, 117, 134, 138]. An important outcome of surgery of pituitary adenomas is the immediate cure rate and the impact on normal pituitary function. In our study we restricted the analysis to studies that reported both short-term and long-term results of surgery in unselected patient series. Our data analyses demonstrate that patients with NFA have a lower chance of remission, which is not too surprising, because many patients are not diagnosed until the tumor is large resulting in compression of the optic chiasm with generally substantial supra- and para-sellar extension, making curative surgery less feasible than in (functioning) adenomas restricted to the sella turcica. Indeed, many studies in acromegaly, prolactinoma and Cushing’s disease, have stressed the difference in remission percentage between patients with a microadenoma and those with a macroadenoma [34, 80, 152, 153]. The overall (initial) remission in patients with prolactinoma is comparable with the remission achieved in patients with acromegaly and Cushing’s disease, suggesting that the tumor type per se does not influence outcome. Recurrence of a functioning adenoma was based on the reappearance of clinical signs and symptoms, confirmed by biochemical tests, as used by the authors. In order to allow a fair comparison with the other adenoma types, in NFA recurrence was defined as reappearance of an adenoma, thus excluding patients with growth of a tumor remnant, possible. For this review recurrence was either expressed as percentage of patients who could be followed-up and thus at risk for recurrence (thus controlling for deaths and other causes of follow-up failure) and as recurrence rate. The latter expression is the ratio of number of recurrences and total years of patients at risk, thus (partially) eliminating differences in follow-up time between studies. This study shows that patients with acromegaly had fewer recurrences than patients with other pituitary adenomas, both expressed as percentage and as recurrence rate. In contrast, patients with prolactinoma had a higher recurrence percentage and rate than patients with acromegaly or Cushing’s disease. At present, this behavior of prolactinoma is largely unexplained, but may be related to definition of cure, or to more frequent microscopic tumor infiltration into normal pituitary tissue, which is not removed at surgery. Another interesting point emerging from this study is that the remission percentage of transsphenoidal surgery did not improve over the last three decades. The majority of papers (>95%) which were included in this review were based on traditional surgery using an operation microscope, without the use of other tools, such as intraoperative blood sampling of hormones, intraoperative use of MRI, neuronavigation or the additional use of an endoscope. If earlier reports estimated the remission percentage to be too high, a publication year-dependent decrease in recurrence percentage and rate would have been expected. Indeed, the review demonstrated a very moderate decrease in recurrence rate over the years, which could also be explained by improved surgical techniques, increased experience of neurosurgeons and the limitation of performance of pituitary operations to dedicated surgeons. Furthermore, a very weak correlation between remission and recurrence percentage was found, explaining only 3% of variability, indicating that remission and recurrence are largely independent phenomena. These observations, therefore, indicate that remission rates reported in earlier publications are not greatly influenced by less sensitive hormone assays in use at that time. One might suppose that a longer follow-up period will lead to a higher recurrence rate. We investigated this hypothesis, which was only possible in studies which reported details on the time of recurrence after surgery, or gave sufficient data to calculate these data. Fortunately, the percentage of studies of the 4 tumor types reporting these details was comparable, and lying between 70 and 77%. For a meaningful comparison between studies, the time period was divided into bins of less than 1 year, between 1 and 5 years, between 6 and 10 years, and longer than 10 years. With the limitation that the majority of studies were shorter than 10 years, the incidence of recurrence peaked between 1 and 5 years, and not later. It is not unreasonable to assume that adenoma recurrences originate from tiny postoperative tumor remnants, with insufficient hormone secretion (or size) to affect biochemical tests or detection with high-resolution MRI. Apparently, the growth rates of these recurrent tumors are comparable, although recurrence of functional tumors is no guarantee that they can be detected by MRI or high resolution CT scanning. The clinical factors of age, gender, tumor size and invasion had no predictive value in most studies, independently of the tumor type. However, there is no agreement whether silent corticotrope adenomas have a greater growth potential than NFA tumors. This matter is of some importance, since prophylactic postoperative irradiation has been advocated for this type of adenoma. However, our review indicates that this issue is still unsettled . Particularly, regarding acromegaly and prolactinoma one might expect that a normalized TRH test (normalization of a paradoxical GH increase in acromegaly and stimulatory PRL in prolactinoma) would indicate permanent cure. Indeed, in prolactinoma this was found in 3 studies, but not in another study. A comparable situation was found in acromegaly. A paradoxical TRH test in acromegaly is considered as non-diagnostic and thus clinically not useful, because it can be also present in other conditions, such as in children, anorexia nervosa, and serious liver disease . Interestingly, acromegalic patients with a paradoxical response of GH to TRH express the TRH receptor in the adenoma, while TRH-negative patients do not , establishing the pathophysiological basis for this response. In a selected series of acromegalic patients who had a normal postoperative GH suppression (although differing in magnitude) and a normalized TRH test, only one recurrence was noted after a 14.3 years . Others also found the test useful  but not all [158, 159]. In our experience, if an abnormal TRH test is the only biochemical abnormality observed, it may take a long time before a relapse becomes clinically obvious, thus requiring long-term observations . The low number of reports in Cushing’s disease and acromegaly, relating outcome of hormone suppression tests with recurrence. renders the usefulness of this parameter doubtful at this time, and careful studies, such as initiated in acromegaly by Freda are required to establish its value . The most interesting predictor of recurrence was a low postoperative basal hormone concentration for functioning adenomas, and not dynamic tests, although these were not systematically investigated in most studies. Depending on the sensitivity and specificity of the assay, a low hormone concentration indicates no tumor remnant or a residual tumor mass which does not lead to clinical significant growth. Whether this latter hypothesis is correct can only be ascertained when more unselected studies with much longer follow-up become available. New pituitary deficiencies caused by surgery were reported in only 60% of the publications. In the majority of these, only basal hormone concentrations were used, rather than dynamic tests. In addition, GH reserve was rarely investigated with stimulation tests. Nevertheless, pituitary function was most often disturbed in Cushing’s disease, which can be partially explained by long-term glucocorticoid dependency and the commonly observed permanent diabetes insipidus. It is also possible that more aggressive surgery was used than in other adenomas, because of the seriousness of the condition. In many studies details were insufficient to outline the precise distribution of newly developed pituitary malfunction. A new approach in pituitary surgery is the endoscopic technique. For this review, we only found 4 studies exclusively using the endoscopic technique and with a sufficient follow-up period for inclusion. Available studies which compared traditional transsphenoidal microsurgery with the endoscopic surgery indicate that the endoscopic technique is associated with a shorter hospital stay, less blood loss, fewer nasal complications and less frequent diabetes insipidus. Although these findings are important, till now no major improvement of direct postoperative remission has been demonstrated and long-term data are not yet available [161, 162, 163]. In summary, this analysis indicates that remission is lowest in patients with nonfunctioning adenomas, and recurrence is highest in patients with a prolactinoma. The remission rate has not improved over 3 decades of publication, but there is a modest decrease in recurrences with time. The highest incidence of tumor recurrence is between 1 and 5 years after surgery. Surgery-related hypopituitarism was highest in Cushing’s disease. The most important predictor for recurrence is the postoperative basal (non-stimulated) hormone level in functioning adenomas, while in nonfunctioning adenomas no single convincing factor could be identified. We thank Johannes W. Schoones, medical librarian, for his help and advice on the structured literature search and Ashley Bryant for his help with constructing the 3-D plots in Sigmaplot. We are grateful to our colleague Dr. Neveen A. T. Hamdy for the critical reading of the manuscript.